But until that happens, we regularly have “breakfast for dinner,” and the kids get a huge kick out of it. Our favorite pancake recipe is an adaptation of the Ultimate Melt-In-Your-Mouth Pancakes from Betty Crocker — only we use my homemade Bisquick mix substitute instead of a boxed mix. I also prefer to use fresh lemon juice, and while I’m at it, I zest the lemon into the mix before juicing it. It’s the little things that can make a big difference. My family thinks my homemade pancakes are even better than the boxed stuff! And who am I to argue with them? Heat skillet over medium-high heat and grease with the oil of your choice. We like to use coconut oil. Whisk all ingredients together until combined. The batter will still be a little lumpy. Pour by 1/4 cups onto skillet and cook until the edges are dry. Flip pancakes and cook until golden. Your website used to show the comments – I’ve tried on two different browsers (IE and Chrome) and can’t see them. All I get is the option to add my own comment, so I am. Looking for the previous comment you provided on how to use this homemade bisquick to make waffles. I love this recipe and lost my notes on how to make waffles. Can you please provide?? When cooking pancakes I know they’re ready to flip, when bubbles pop through the batter. 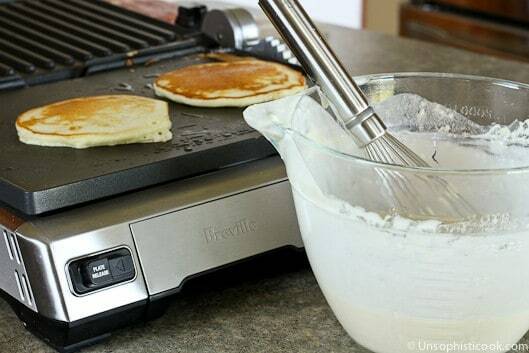 We’ve been using your biscuit mix for pancakes for awhile now. I love it. Thank you for sharing your recipes. 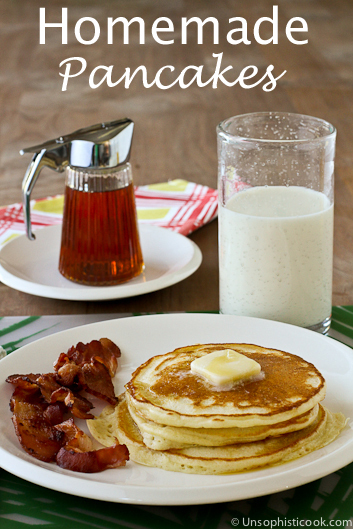 I love pancakes for dinner too…homemade is definitely the way to go!